We are making an IMPACT–in more ways than one. 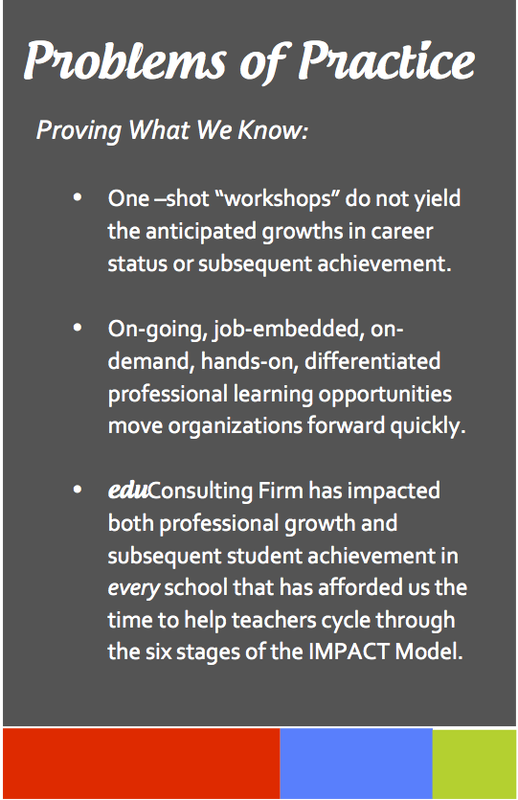 The IMPACT Model defines six elements we believe to be critical components for propelling positive, growth-producing professional learning for any organization. Instructional Practice: Instructional practice identifies the targeted methodologies or pedagogical practices and their underlying concepts which form the content of the expected learning outcomes. What is it the organization seeks to learn, discover, develop, adapt, and/or improve? What forms the theoretical basis of these practices, and how do you make them applicable in real life, in real time when the context does not always conform to “textbook situations”? What does the practice look like? How is it carried out collectively within the organization and by individuals? How is acquisition of the required knowledge obtained and then used? What are individuals expected to know and do? Metacognition: Metacognition, already a popular notion in education, applies in just the same way here–thinking about one’s thinking. Continuous self-reflection is not limited to but must, obviously, include one’s own individual understanding of the instructional practice. How well does he understand the practice? What does the practice require the individual to do that is different from what he is already doing? This type of reflection is a constant and deliberate self-monitoring that occurs before, during, and after implementing the instructional practice. Perceptions: Perceptions relate to how the individual views his or her role in carrying out the instructional practice. How well does the individual believe he or she can do what is expected? What does the individual think of his or her existing skill set to carry out the new expectations? How confident does the individual feel about applying the new learning? Does he view himself as an integral and vital part of the implementation? What is his perception about how others view his role and responsibility in this process? Metacognitively, does he possess the efficacy to put the instruction into practice and thereby move the organization forward? Attitudes: Attitudes are grounded in values and here indicate the extent to which the individual values the instructional practice and its potential to contribute to and improve upon both his individual professional growth and the advancement of the organization. Does the individual believe the practice is worth the effort, energy, and time required for proper implementation? Does the individual have the intrinsic motivation to engage in the process? Collaboration: Collaboration is the act of continuous collegial engagement and support in the implementation of the instructional practice. Is support available–not just in the form of monetary resources but in professional capital? Are all parties willing to participate, engage, and work together for the good of the organization and each other? Transference: Transference is the effective and efficient implementation of instructional practice in novel situations. Assuming one has acquired the knowledge, skills, purpose, and motivation to put the instruction into practice, can he now do so in such a way that fits a particular context, under less than ordinary conditions? Can he take his new learning and adapt it for new situations? The IMPACT Model outlines a continuous improvement process, and each of the elements proves to be contingent upon the other. For example, strong collegial support gained through planned collaborative efforts may actually increase self-efficacy and promote more positive attitudes about implementation. We are making IMPACT in a way we think matters most–in schools, with administrators, teachers, and students. Triangulating this largely qualitative model with traditional data sets (benchmark reports, climate surveys, test data, teacher effectiveness measures, etc.) and our own data including observation summaries (SWOTs), goal-setting attainment, progress monitoring, effectiveness surveys, and teacher SWOT Journals provide additional insight into the extent of our impact. To learn more about IMPACT and our work, visit us at home eduConsulting Firm.